I’m sorry for writing this ebook. 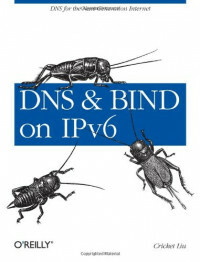 This book is essentially all the material related to IPv6 that I would have included in the sixth edition of DNS and BIND (and will, once I get to it). It covers how DNS was extended to accommodate IPv6 addresses, both for forward-mapping and reversemapping. It describes how to configure a BIND name server to run on an IPv6 network and how to troubleshoot problems with IPv6 forward- and reverse-mapping. It even covers DNS64, a DNS-based transition technology that, together with a companion technology called NAT64, can help islands of IPv6-only speaking hosts communicate with IPv4 resources. This book offers advice on a range of critical subjects pertaining to security practices and procedures. Anyone moving toward a converged platform will find the approach beneficial and illuminating. Phil Norton, Arthur J. Gallagher & Co.
SEE IT DONE. DO IT YOURSELF.